Elven Glades: GuardCon, Part 2, Results and Summary. GuardCon, Part 2, Results and Summary. Wargaming in Auckland during September gravitates towards GuardCon each year. 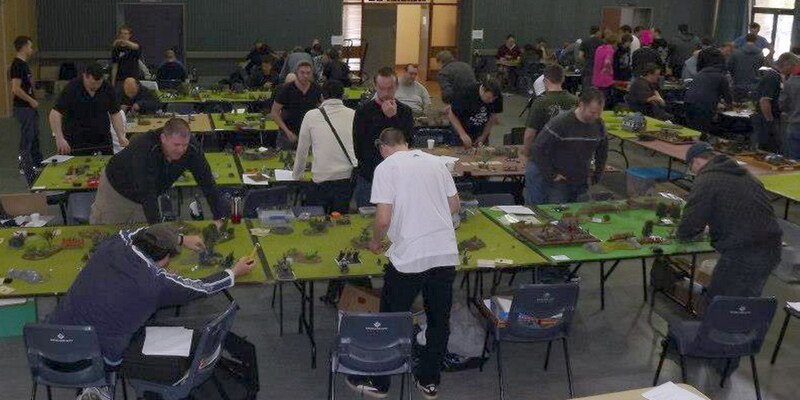 The Auckland city Guard club holds it's annual wargaming convention and more often than not it is usually a packed hall with well over 100+ avid hobbyists in attendance. This year we saw a few of the countries enthusiasts gather to get their game on at the Freemans bay Community Centre in Ponsonby. 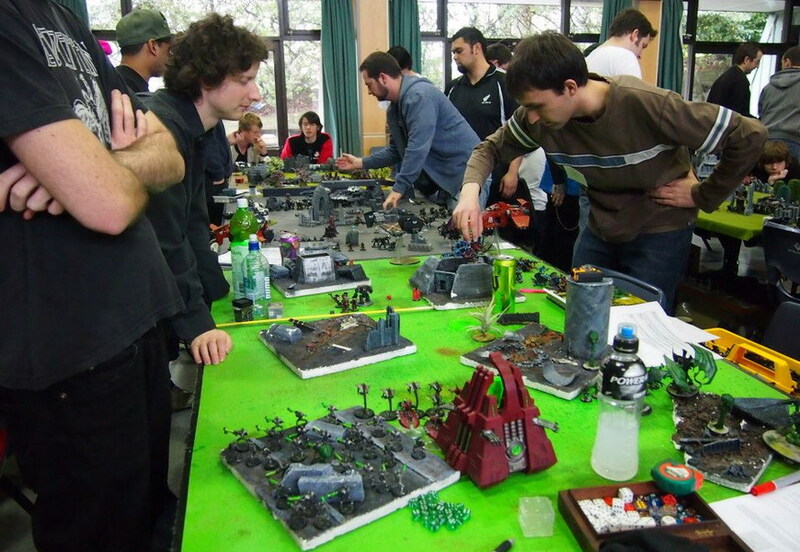 The two main tournaments being held this year was the hotly contested GuardCon shield for Warhammer Fantasy and the Warhammer 40K doubles, which is the countries largest event at 60 competitors. On the left we have Warhammer Fantasy. Right handside we have the Warhammer 40K doubles. 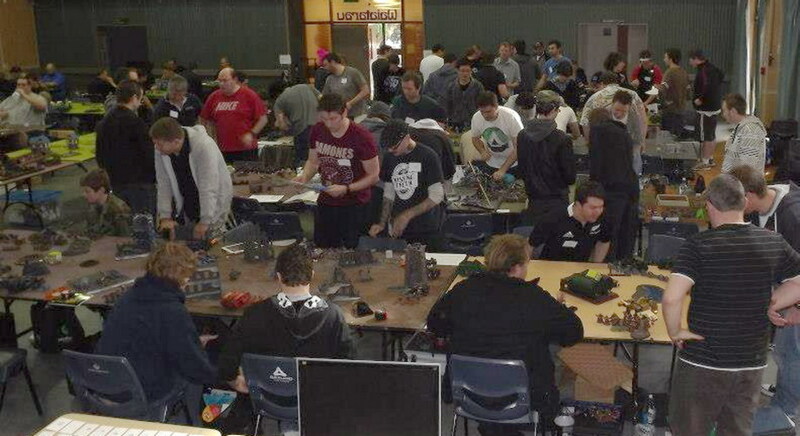 This years Warhammer Fantasy event saw a competitive field of hobbyists. With the usual Skaven armies not in attendance it was the Ogre hordes that showed up in force that were most noticeable battling it through the field. GuardCon is traditionally a softer tournament that's designed for all levels of wargaming but this year the comp stick was left at home. I've found that if you as a TO ask for softer lists there is always someone who will inevitably surf the limits and the great hobbyists who are sports and relent, inevitably come with a knife to the gun fight. It's a lesson that I have learnt and in future I will trust the hard caps to do its thing and with limits set there will be less things to confuse any list designs. 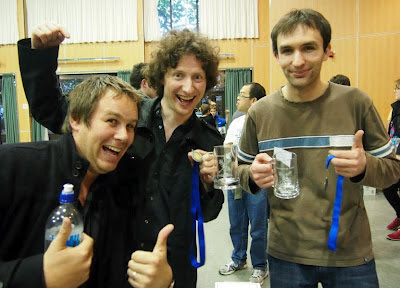 In saying that most of the lists that attended were very even par and you can see that with only 5pts separating the podiums it was indeed a very closely fought tournament. Congratulations to the Champions. Just a few summary points that I noticed and also some received suggestions to mop up another great Guardcon tournament. 1. Scenarios- With GuardCon and Equinox to follow early next year the two biggest tournaments on the Auckland Calendar. It has been suggested that they will not feature scenarios and instead have 6 games of Battle line. I think this is a very good idea as it provides a neutral starting point in any perceived advantage to all armies in attendance. If there is no immediate objections Equinox will be the first tournament that will feature 6 games of battle line. 2. 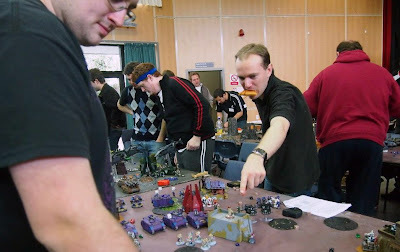 5 or 6 games in a tournament?- I've always believed in 6 games to decide a tournament and feel that 5 games doesn't quite give you enough time to get in stride. With 6 games it also gives travellers bang for their buck. I won't try to split them 4 and 2 and will continue a 3 games per day tournament for Equinox. At Equinox you do get the opportunity to play a fourth game on the Saturday night but that is a much more relaxed affair which is aimed more towards socialising than any actual competition (well that's what it is intended anyway). 3. Comp will also have a bit of a shake up and will follow the SCGT with adjusted amendments for Equinox. With complaints about Death Stars and Crown of Command, it will be best if we bring most tournaments in line as a trial at Equinox. With ETC restrictions a little confused at present and not suitable for just normal tournament play we'll try another system as a trial. 4. Timetable: I have been very accommodating towards early air flights and rushing prize giving. I feel that rushed prize giving really dilute the event and in future prize giving's will be not rushed and will be on timetable. If you have booked early flights there is always the option of having your Trophy and prizes sent to you later. Even better would be if you can book later flights and also stayed to congratulate the winners and share in the celebration at the end if you can. Let me know your thoughts and Thank you for your participation in this years GuardCon. Just to get in a big plug at the end of the summary ** Enter Equinox 2013 and get $10 off early registration until the 1st of October if you saw this here** Players packs will be out this weekend. Another big tournament of doubles this year and we've reached our goal as the biggest tournament in the country. Everyone seem to have enjoyed the tournament and with a bit of fine tuning we'll be bigger and more prepared for 6th next year. A big thanks goes out to the team of guys who also helped Matt the umpire out setting up the tournament. If you are keen to be involved with the organising group please give me a yell. The results speak louder than words and with only 10 points separating the top 8 teams it was a very close tournament this year. Yummy Death took out the honours and if you guys know Pascal & Mike you should definitely go ask them why they got that name. Bloody angels teamed with Tyranids must be the new 6th edition meta or maybe not as the case may seem. I hope you guys all enjoyed the 6th edition doubles bash and are looking at coming to more tournaments in the future. The Auckland City guard welcomes all tournament goers & Hobbyists to our club rooms if you get a chance to get in more warhammer and we are open every Sunday 1-5pm with plenty of tables, terrain and regular opponents for you to get your hobby on. We're at the same hall as the tournament so just bowl on up and you'll be most welcome. Congratulations to the winners and here's the results. Groupies come with being the Champs. Like a bause, Pizza and Warhammer! Good wrap up Phil, big fan of the SCGT pack and looking forward to it. 6 Battle Lines? Well I suppose it's worth trying out, although if the the initial scenarios were just modified slightly I think they could keep everyone happy. I had a great time at my first singles fantasy tournament - thanks for organizing such a great tournament Phil! Having said that, 6 battle lines sounds balls. If you really want to neutralize any perceived advantages to armies then you should get us to all to run the exact same army list and have 6 games of battle line. But seriously, the missions really spice the game up and I'd miss them if they were gone. I'd be very happy to play SCGT comp and 6 games of Battleline. I think it would be great fun for a change, a bit sick of scenarios. Really enjoyed the Tournament mate, excellently run, reasonably happy with how I played most of the time, bar games 1 and 3, and stoked with 5th place! Currently consulting the Panel that's helping with the implementation of the Players pack for Equinox 2013. I'd thought it would be good to have it all ready and posted 6 months before the tournament. Currently there is a strong lean towards bringing back select scenarios and most have voted for the SCGT v2.1 restrictions. The same restrictions will be played at the 48 man tournament a month before Equinox, which will also lend to good grounding and consistency from tournament players. Nikola who is a regular veteran 40K player will be taking the mantle of the Equinox 40K Umpire. Equinox 40K will be ranked and single play missions. Good meat if you're after some thing more competitive than GuardCon doubles. We're getting good numbers and if you in for another big tournament to enter please visit the link below. WarHammer enthusiast behind the driving wheel of many Wargaming Armies. If you name a System I've probably got or am playing it. Tournament goer and lately Tournament Organiser. Sit back and enjoy some tales of conquest and glory from the Elven War Host. 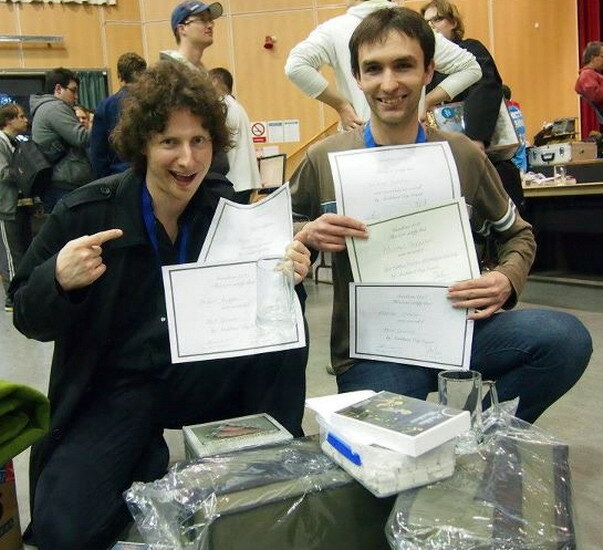 Equinox 2019 - Warhammer 40k results. 9th Age Fantasy Battle Wargame - What is it? GuardCon 2 days and counting. Elves are back in black. 9 inch charge! : New gaming blog (and a bit of Epic). The Little Warrior that Could! The Great Dwarven Experiment 3: Why? Just why? The 30-Day Lean & Mean Challenge! All material not deemed otherwise remains Copyright and are sole property of their relevant owners. Awesome Inc. theme. Powered by Blogger.